Investment is key to achieving growth, because it can’t be achieved if you haven’t got products that people want, and ADL’s determination to make sure that they can supply buses operators want to run has seen the number of new product development (NPD) projects in hand more than double from 11 in 2011 to 23 currently underway. 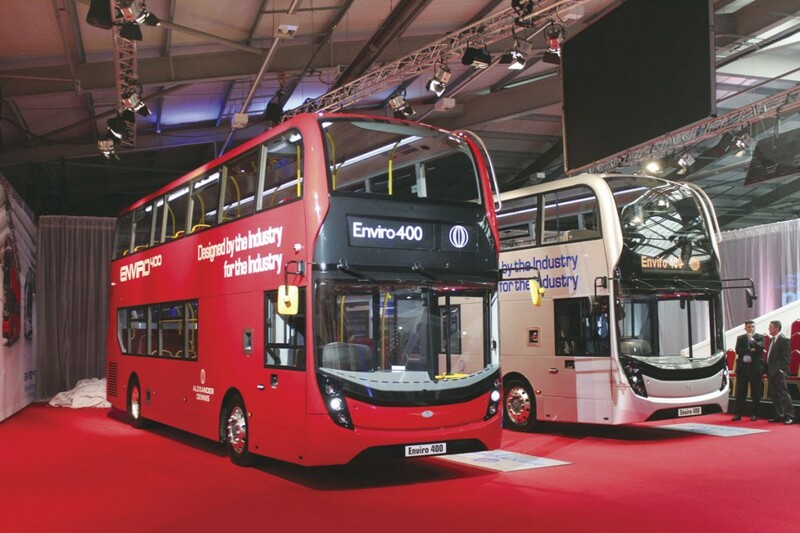 The new Enviro400, in which over £7.5m has been invested over the past three years, is just one such project, though it is being offered in two different heights, two lengths and also as a body for mounting on other chassis (Volvo B5TL and Scania) as well as a fully integrated ADL bus. As well as talking to operators, representatives of drivers were also involved in the engagement process, particularly with regard to the cab. At the same time, passenger views of the existing product were gathered and taken into account. In addition, warranty and RMV (reliability, maintainability, value) workshops were held, involving every area within the business, to identify where other improvements could be made on what went before. Every Enviro400 defect reported since 2006 was analysed and there are said to be over 200 improvements. ADL Programmes Director, Alan Clark, explained that the size of the task had been set by the size of the challenge, which was to replace the UK’s market leading double decker with a new bus that would sustain that position for the next ten years. All of the various strands of input were combined within what was referred to as an ABC concept, with the A representing a platform approach to designing the product to ensure the capability to accommodate new technologies, B representing Best cost of ownership’ and C customer-valued enhancements. A dedicated core team was drawn together from all areas of the business with former Plaxton man, Tony Cheetham, working as MMC Project Manager. 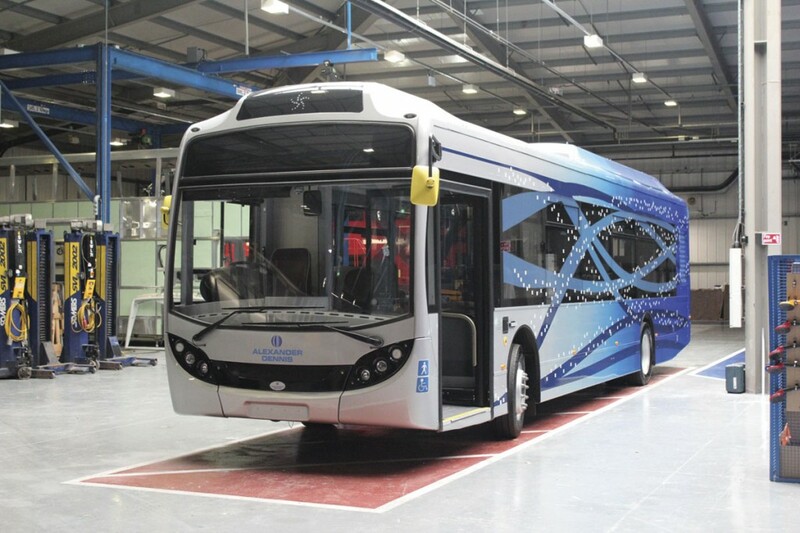 In an excellent video presentation describing the development of the Enviro400, Robert Davey, Business Development Director, said one of the objectives was to be able to demonstrate to customers that the whole life cost is measurable as well as lower and cheaper than that of the competition, while Colin Robertson described the new bus as ‘the most thoroughly engineered new product that we’ve ever launched.’ Claims that it will be, ’the most reliable and fault free bus ever’ and have ‘build accuracy second to none’ are incredibly ambitious, but the ADL team appear comfortable with them. Two different height options are offered (4300mm and 4200mm) and examples of both were shown at the launch. 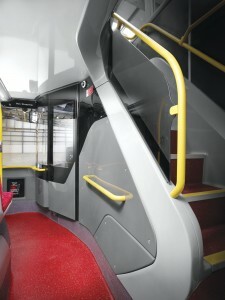 The standard height bus was a dual door example to TfL specification with Lazzerini seats and the provincial specification single door bus was a silver painted example equipped with Esteban e-leather seats. The difference between the standard and the low height versions has been reduced to only 10cm (the previous standard height was 4,400mm), all of this evident externally in the depth of the main side panels between the upper and lower decks. Saloon heights on both models are the same. The internal reduction is accounted for by directly mounting the body to the chassis frame and the use of a new sandwich construction interdeck. The construction process is now greatly simplified with the differences between the two models minimised; in the past the workforce was effectively building two different buses. There are three single door length options; 10,345mm, 10,895mm and 11,495mm with only the 10.3m variant offered in dual door format and only the 10.9m version offered with the reduced overall height. All versions have 17,800kg GVWs. Wheelbases are 5,250mm, 5,800mm and 6,400mm respectively and all versions have a front overhang of 2,650mm and a rear overhang of 2,445mm. 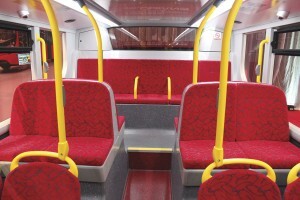 Maximum single door seating capacities are: 10.3m, 74 (29/45); 10.9m, 82 (49/33); and 11.5m, 86 (49/37). 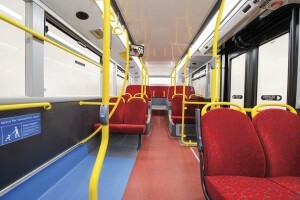 The dual door 10.3m has the lower deck capacity reduced by four to 25. These figures represent seating capacity improvements of one person in the 10.3m to London specification (five in hybrid versions) and a useful seven in 11.5m diesel powered buses. All seats are full width units. In appearance, the Enviro400 is distinctly different from the existing model though you can see the lineage. That said, every panel and piece of glass is different in this ground up renewal with no commonality across the generation change. Considerable attention has been paid to avoiding any exposed fixings or dirt traps. To this end the easy to remove side panels all have hidden hinges and retainers and the formerly proud surrounds for the fuel filler have been blended in through flush mounting. Both the front and rear screens are bonded in place, the lower front unit being a large single piece wraparound item while that on the top deck has pronounced curves, especially at the top. Between decks at the front, a full width contoured destination display cover is glazed, linking with the window pillars to bring shape to the frontal aspect. In line with widespread customer preference there is quite a large lower deck rear saloon window that helps make the lower deck light, and there is also a full top deck rear window. In keeping with the clean look, rubber gasket glazing is not an option, but this should not lead to criticism from those who want to ensure swift glazing replacement because what ADL has come up with is, to my mind, one of the most impressive aspects of the new design. In the past it was a choice between bonded glazing, which looks good but can be time-consuming to replace with a curing time of several hours once the replacement has been made, or gasket glazing, which is relatively easy to replace but looks heavy and unattractive. The ADL alternative, for which it is seeking several patents, is a system called QRG (Quick Release Glazing). This incorporates solid window frames as part of the structure of the bus, which give the appearance of bonded glazing. The glass is simply installed in the frame from the interior of the bus, secured in place by a clip on each edge and then finished by the addition of four finishing strips that clip into place with the help of simple tools. The process of fitting or removing a pane takes under three minutes and you or I could do it in that time plus any sweeping up required. Not only is it safer for the person doing the work, it is less prone to the attention of the determined vandal. Even if you hang on to the stanchions and throw all your weight at it through your feet, you are not going to push the frame out because it is part of the bus structure. Another benefit is that thinner, lighter glass can be used, down from 5mm to 4mm with a further reduction to 3mm under consideration. We did not see one of the new vehicles running but were told that window shimmer has been virtually eliminated. The side windows on both decks remain full height; a contrast to the approach Wrightbus have taken with the upper deck of their latest generation decker. The reason they gave for changing was to reduce solar heat gain on the upper deck, an issue ADL has tackled in a different manner, developing a completely new heating and ventilation system. 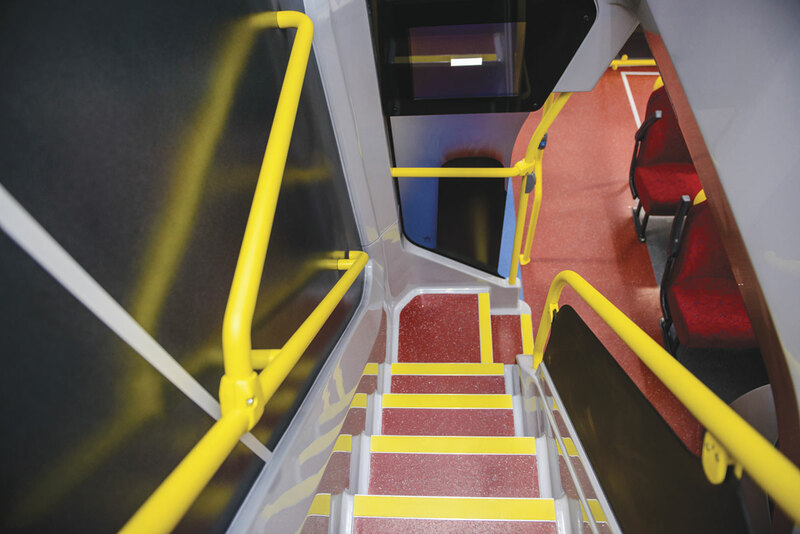 Located in the lower saloon beneath the bottom step of the staircase a new heating unit quickly forces air throughout the bus to create a constant temperature throughout. 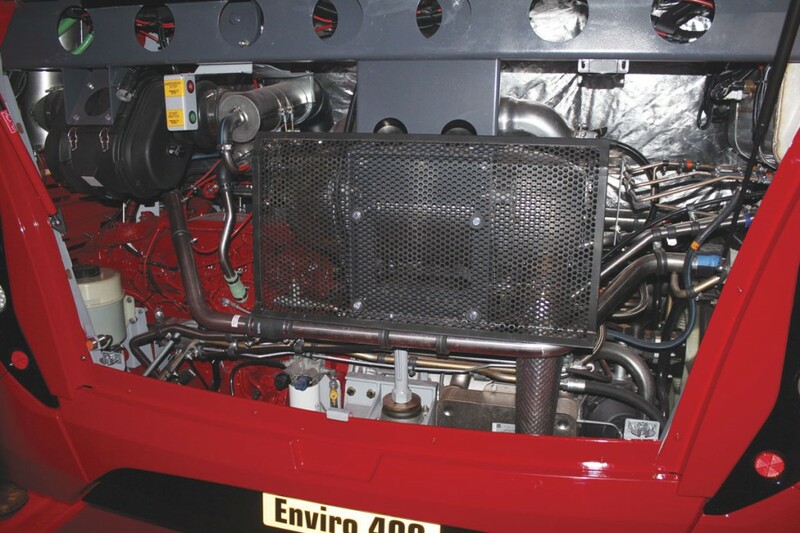 When linked with an optional air chiller over the staircase on the top deck, it can maintain a steady air temperature of 17-18 degrees centigrade throughout the bus. One of the comments appreciated by the operators involved was the way in which a spacious feel had been created for the interior, with one commenting that it looked bigger inside than out. In addition to the large windows and rear window there are a number of factors that contribute to this, among them a more compact, but easier to use staircase (or squarecase as ADL like to call it) with a continuous handrail to the right as you ascend. The cab is actually slightly larger, but the single seat beneath the staircase has gone, the fuel tank beneath the stairs has been redesigned with a reduced footprint and the result is more interior space. This is accentuated by the use of gloss finish mouldings in grey and black on the cab door and staircase which give flow to the interior lines. Head room is excellent; at 1.81m tall I was able to walk without stooping all the way to ahead of the step up to the rear seat of the lower deck on both buses. It isn’t just more attractive it is far more practical. Among examples of this are saloon cove panels that can be taken down without destroying them. The ceiling units incorporate a multi function extrusion that includes the LED lighting strips, the track for the hand pole stanchions and on the outer side a groove that the panels slot into. In the offside rear saloon corner, the door to the electrical circuits within is designed to stay open until you want to close it and at the front of the upper deck, once you have opened the door to the front destination panel, you only have to undo two bolts and you can then tilt back the whole of the destination gear. For the driver, the cab is now more spacious and the layout more ergodynamic with positive feedback switches, reasonable storage space, an extensively adjustable wheel and binnacle that moves with the seats, a coat hook to the driver’s right (though I thought a garment hung on it might rub against the driver), instruments that are easily to hand, ancillaries such as the optional fan designed in, and an excellent view through the screen. The Chapman air seat is designed to be able to accommodate all shapes and sizes comfortably. The cab door has a new quieter to operate latch and should not rattle thanks to a continuous rubber bubble seal that maintains separation between door and frame. Ask anyone trying to run secondhand first generation low floor deckers and they will tell you that one of their most troublesome aspects is the electrical system. It will be a good while before the new generation Enviro400s are on their second or third lives but when they are the electrical systems should be a lot more reliable and easy to repair thanks to a number of innovations prompted by operators and adopted by ADL’s designers. 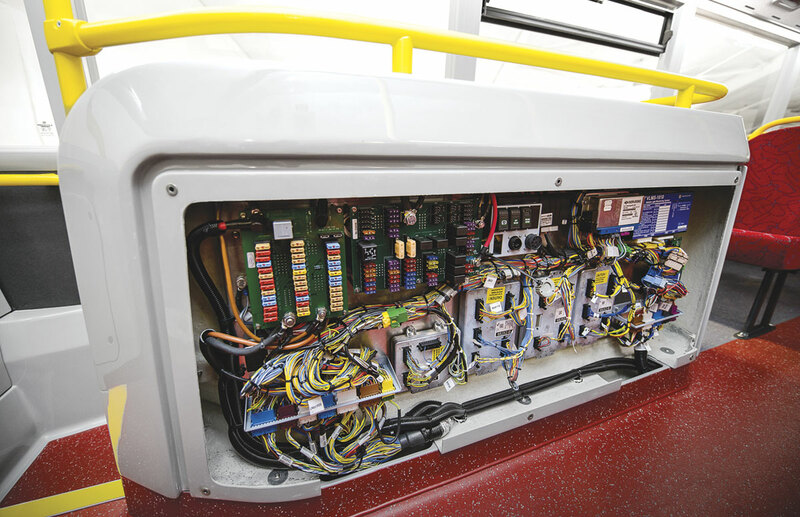 Rather than running long harnesses the length of the bus, the circuits are split into shorter sections that enable faults to be more easily diagnosed and any problem sections replaced. Where cables pass through bulkheads, there are connections on either side into which the cabling is plugged, ensuring there is no chafing. No sensitive control cables go outside the vehicle and all cabling used is now of an enhanced quality more resistant to heat and corrosion. The main electrical control centre is located out of harm’s way in a cupboard incorporated in the top of the staircase surround, where the weather and other vehicles are unlikely to damage it. There is sufficient space within it for an operator to have their own additional systems added in. On the previous model there were two fuel tank shapes, but now there is only one tank, manufactured of aluminium, that holds 275-litres though it can be fitted with a choke that reduces the capacity to 200-litres. This choke device can be removed if a bus is relocated and a greater capacity is required. With my previous experience it feels odd to be describing the driveline of a new bus last but despite the move from Euro5 to Euro6 this almost seems the least revolutionary aspect of the design, although a lot of work has been done on airflow within the engine bay. The engine is the Cummins 6.7-litre ISB developing 250bhp (187kW) at 2,100rpm and peak torque of 1,000Nm at 1,200-1,600rpm. Mounted transversely at the rear, now features EGR (exhaust gas recirculation) as well as SCR (selective catalytic reduction, a variable geometry turbo (VGT) and a DPF (diesel particulate filter). As with the current generation model there is a choice of transmissions with integral retarders which can either be the ZF EcoLife 6HP1203 six-speed fully automatic or the Voith D854.6 W53 four-speed fully automatic. Axles are now ZF all round with the RL75 drop beam at the front and, replacing the former Dana unit, the AV132 drop centre unit at the rear. ZF also supply the 8098 variable ratio power steering. 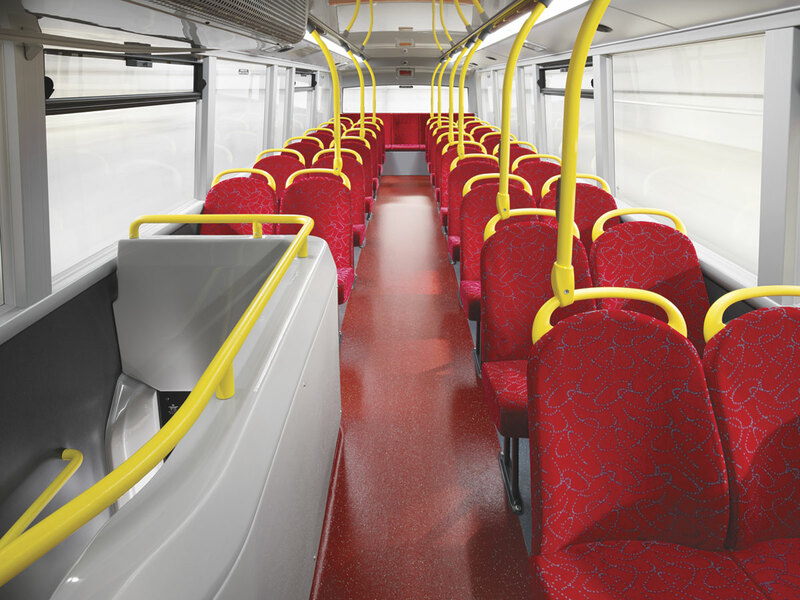 EBS is now standard along with an ELC electronic levelling control that prevents the bus settling when stationary. Benefiting from the customer focus programme, access to components within the engine bay has been improved. Although it was originally feared that Euro6 compliance would incur a fuel penalty, along with most other manufacturers ADL, which has been testing six buses in service with the driveline for over two years, is confident that there will be a fuel saving with the new generation models. Early tests at Millbrook show a 12% reduction in fuel use. Weight is no doubt a factor in this, with the unladen weight reduced by 400kg (possibly more) to under 11 tonnes despite the Euro6 power unit being 250kg heavier. Interestingly, ADL, which was the first of the manufacturers to go down the route of downsizing engines when it moved from the Cummins C series to the six-cylinder B series, has not downsized again when Volvo, Wrightbus and probably Optare are all going for five-litre units. I know London operators are quite in favour of the five-litre move but I’m less sure that regional operators welcome it and with between 1.7 and 2.0-litres more displacement this could give ADL an edge outside the capital with little or no disadvantage on TfL applications. It doesn’t appear to be an issue for Abellio who have followed National Express in announcing an exclusive three-year deal with ADL for the supply of buses. Of the Enviro400 body on other chassis, it was said that the Scanias scheduled for delivery this year would have the existing body style but the Volvo B5LH hybrids for Stagecoach being bought with the help of the Scottish Green Bus Fund would be new style bodies delivered in the first quarter of 2015. 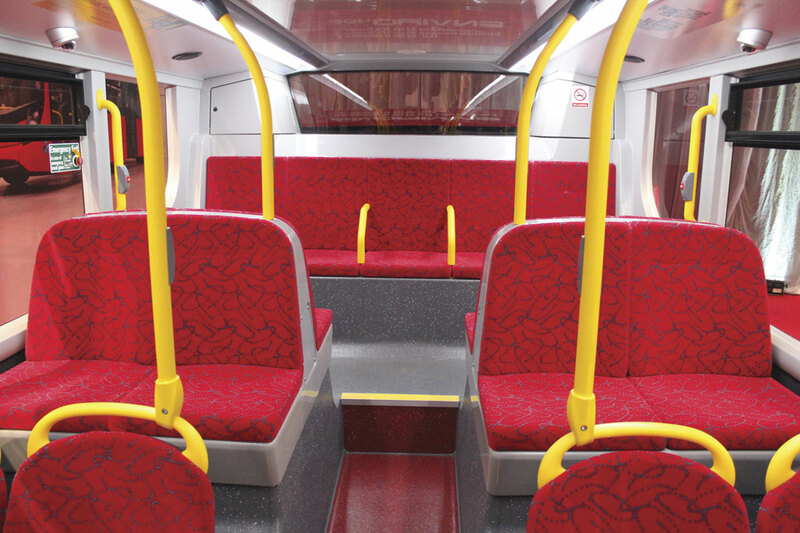 They will have the same seating capacity as the equivalent all-ADL bus. ADL has a good track record of developing vehicles to meet the needs of environmentally focused customers and has always been of the importance of minimising fuel consumption. Group Engineering Director, Ken Scott, who joined ADL from Bentley Motors last autumn, ran through a series of market expansion and technology improvements that ADL is working on to support its strategic goals, both in the UK and export markets, with the aim of keeping the company at the cutting edge of technology and the forefront of the industry. 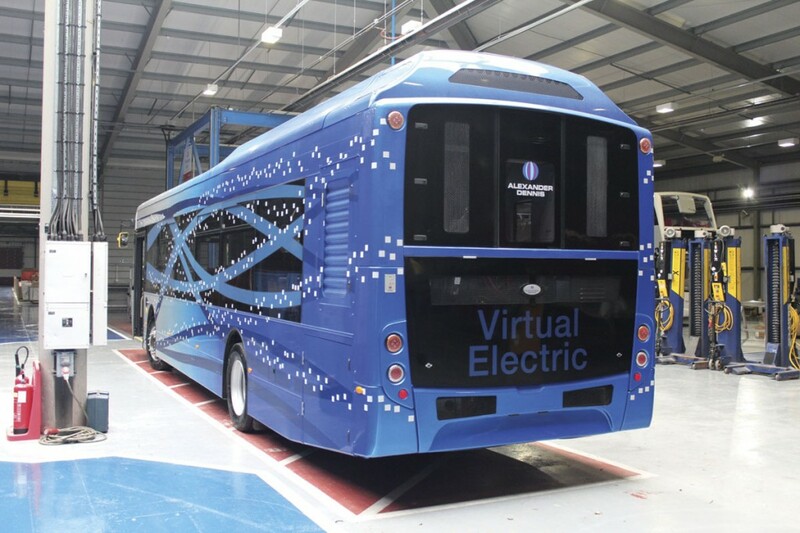 He explained that there was a ‘roadmap’ to the eventual aim of full electric buses, the stages of which were: diesel; diesel with supplementary technology; low cost hybrid; full hybrid; virtual electric; and, ultimately, full electric. It was important to have stages in between diesel and full hybrid, he said. Against this background, Colin Robertson stressed that diesel would still be around for many years to come. Working with Williams Hybrid Power and GKN on an £18m project to bring Formula 1 technology to buses, ADL has plans to introduce a Gyrodrive parallel hybrid system that uses an electro-mechanical composite flywheel as an energy store. For OEM or retrofit installation, the system has been trialled at Millbrook and in service with savings of 25% predicted from it. Unlike other flywheel systems, there is no direct mechanical link required between the flywheel and the rest of the system, which means it can be mounted wherever best suits, and there is also no complex continuously variable transmission (CVT) required. Costs are expected to be cheaper than a battery in whole life terms with the flywheel unit only requiring bearings every six years or so at a cost of around £1,000. 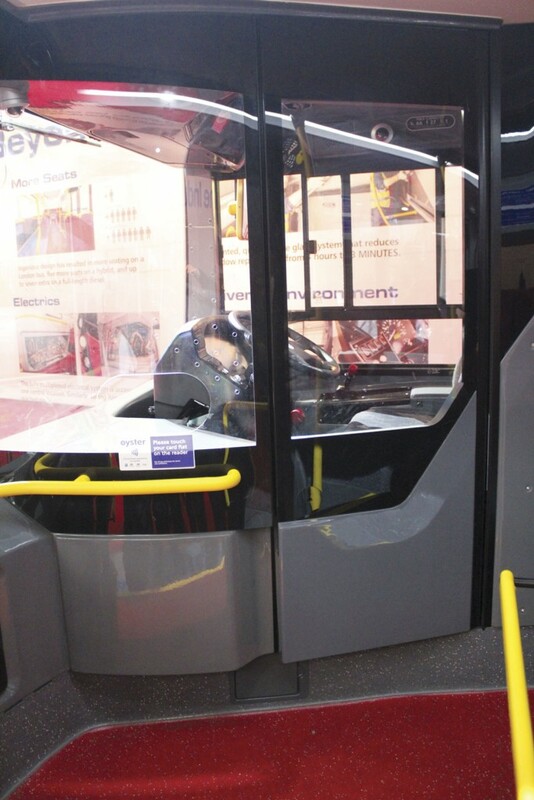 On an Enviro400 the power electronics and flywheel energy store are located in the saloon under a pair of double seats, with the electric machine (a flywheel running at 36,000rpm) and its transfer box mounted on the propshaft. Ken said that field trials on vehicles retrofitted with the device would be running in the fourth quarter of this year with OEM fit vehicles scheduled for 2015. He confirmed that other applications for Gyrodrive were being looked at. Present at Larbert during the launch was the first of the ‘virtual electric’ models as promised by Colin at the NEC last year. Developed with support from Scottish Enterprise as part of a £3.2m collaborative venture, the first examples will operate as part of the EU’s framework 7 ZeEUS project. 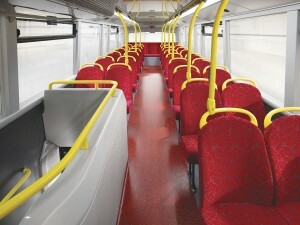 The bus is based on the single deck Enviro350H chassis with its genuinely fully low floor layout. It has the standard BAE Systems hybrid driveline, a bigger battery capacity and an inductive charging function that will enable it to run in a sensitive area in zero emission mode for as long as you like, as long as it is opportunity charged periodically. This is accomplished using two 30kW coils located between the chassis rails in the centre of the bus, though I believe the intention is to go to two 50kW coils later in the year. With the additional Lithium ion batteries mounted on the roof, the virtual electric has the same seating capacity as a standard E350H, all of it directly low floor accessible. The aim is that the batteries should last half the life of the bus. The ethos behind the project is not to require any compromise from the operator, so the bus is designed to carry 70 passengers and operate for 16 hours a day. Electro hydraulic steering and an electric air compressor are used to ensure noise levels are minimum, though I did not witness it running. There’s a lot more to be said on ADL’s virtual electric options and I understand that there will be a further press conference in the not too distant future addressing this. Rather more down to earth is a new option on the Enviro200 that will deliver a 13% fuel improvement and qualify it for low carbon certification along with the 6p BSOG uplift that comes with it. This is achieved by installing the ZF AS-Lite automated manual transmission in place of the standard Allison unit. In place of the torque converter, it has an electronically controlled clutch and a true neutral gear that is selected whenever the bus is stationary. As there are no moving parts when it is selected there is no load as there would be with a torque converter. Already both Arriva and Stagecoach have ordered AMT equipped buses. Conscious that on a typical city duty a bus will use 10% of fuel when moving and 50% when idle on powering ancillary devices, ADL is developing smart accessories for the model that recover energy and reduce consumption. These include an alternator for the electrical systems, an air compressor for the brakes and suspension and a hydraulic pump for the power steering and engine cooling. The three devices installed together should generate a fuel saving of around 7% on an Enviro200. Exporting is as crucial to the long term future of ADL as the development of new products with the two going hand in hand. Already, exports account for around 50% of ADL turnover and further growth will reduce the risks to the company of relying too heavily on the UK market. Illustrating just how beneficial exporting can be, as well as how right it is to fully involve your customers in the development process, is the Enviro500 tri-axle double decker. This was developed with the same degree of customer involvement as the new Enviro400 and has seen a staggering 1,400 export orders won in the past 18 months since it was launched. 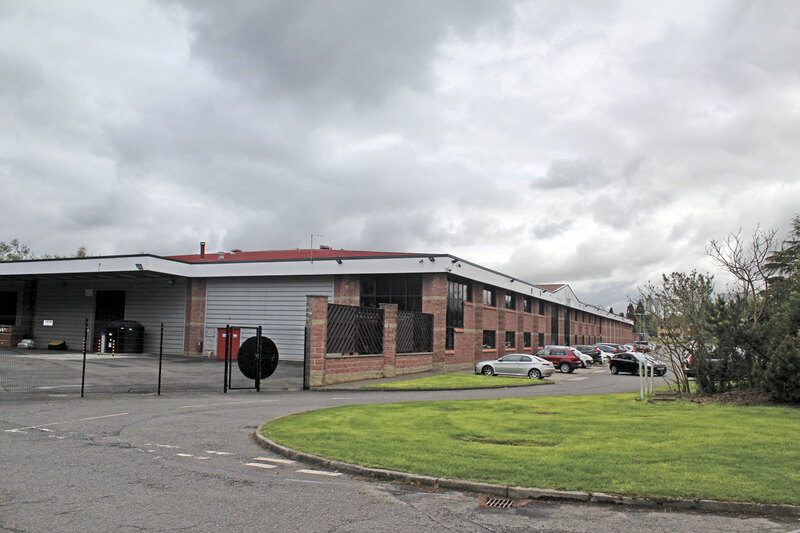 Revealed at Larbert were orders worth around £175m for: 40 for an as yet unrevealed Malaysian operator; 171 from KMB, 86 for New World First Bus and 70 from Citybus in Hong Kong; 201 for SMRT in Singapore; and 22 for operators in Seattle, USA. These are in addition to deals already announced. 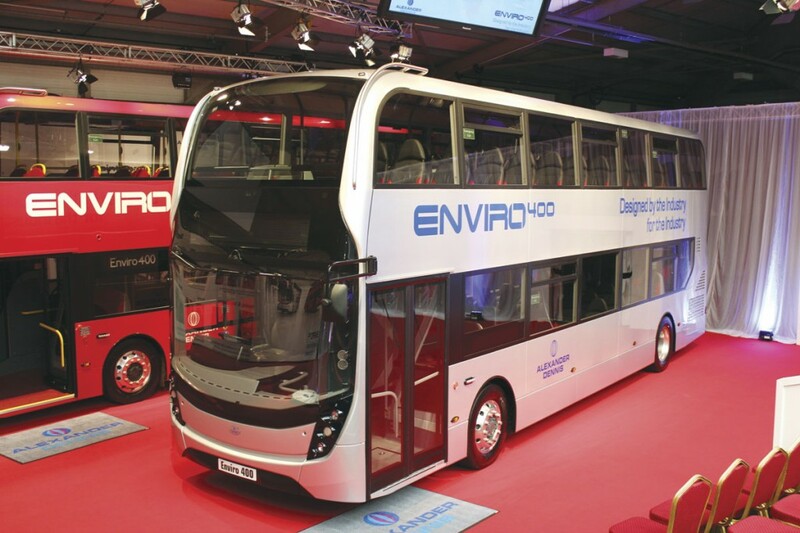 As well as the Enviro500 deal, 80 Enviro200s are also to be supplied to Malaysia. Although the partner has yet to be named, a further chassis and body build partnership is set to be agreed in Malaysia which would increase opportunities for ADL products in what it describes as ‘this gate-way region.’ The new Malaysian venture is additional to two North American agreements, one with ABC in Florida who will assemble ADL open top and transit double decks in Nappanee, Indiana and the other with New Flyer Industries which is to launch a new Enviro200 based midibus in the USA and Canada. Also under development is a new Enviro200 based school bus for the Australian market, where ADL owns Custom Coach, and a double decker for Australia and New Zealand where weight and width regulations are different from those in the UK. Current NPD projects include five for North America including an open topper, seven for the Asia Pacific region and two for the Middle East as well as the polskibus.com Elite-i order for Poland. ADL press conferences don’t happen that often, but when they do they certainly have plenty to tell you about. Things are looking good for the company which has just agreed a five-year refinancing deal ensuring it will have the funds to continue its development worldwide, underpinned by an overall UK bus market share that has topped 45% for the last three years, with market leading products in the midi, single deck and double deck sectors. Having made sales of £540m last year it entered this year with orders worth £300m and has already grown that to over £400m. To my mind the new Enviro400 looks a very impressive bus and one that, to an extent I cannot previously recall, answers the criticisms of its predecessors and the aspirations of the customers at which it is aimed. Journalists can say what they will about how good or bad a bus is but what determines success is whether operators are prepared to commit to buying the product. With 400 orders worth around £80m already in the schedule, ADL must be pretty confident that their hard work will reap the dividends they seek. Deliveries will not start until the third quarter with 120 scheduled (and ADL hasn’t missed a delivery promise for years) to enter service with Go-Ahead, Stagecoach and Reading Transport among others within the next 12 months. Good though it is, and I believe it is an excellent piece of design and engineering, there is more to ADL’s customer appeal than the products alone. Just as important is the commitment ADL is showing in the aftermarket where it has become the one against which others are judged with offerings such as the 24/7 online parts service. First has just signed an exclusive five-year parts supply deal that could be worth in excess of £50m, and I doubt that they would have considered doing that five years ago. This is one helluva stylish bus! !